Freesia flowers are “zygomorphic” which just means that they grow along one side of the stem, in a single plane. When you look at a flower stalk however, you'll see that the blooms are facing upwards. How does this work? Freesias stems have the unusual habit of turning at right angles just below the bottom flower. This causes the upper portion of the stem to grow almost parallel with the ground. The flowers bloom along the top side of the stalk, facing upwards. This makes them lovely to look down into in a garden setting and ideal for arrangements. If you didn't care much for geometry in high school, here's a painless, fragrant and colorful way to give it another try. Way more fun than Mrs. Ryan's class, trust us! Find a location where the soil drains well. If there are still water puddles 5-6 hours after a hard rain, scout out another site. Or amend the soil with the addition of organic material to raise the level 2-3" to improve the drainage. Peat moss, compost, ground bark or decomposed manure all work well and are widely available. Freesia require planting sites that drain well. These plants do not thrive in soggy soil. 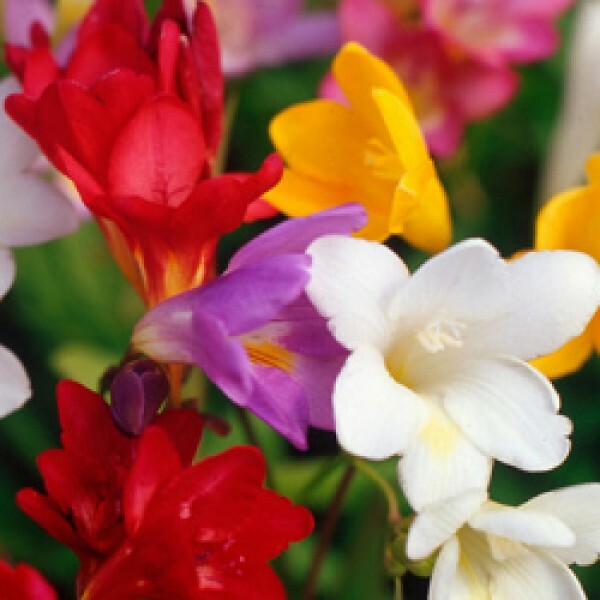 Site your freesia where they will receive full sun for the strongest stems and best flower production. Dig holes and plant the bulbs 2” deep and 3” apart. Position the bulbs with the pointy end facing up. After planting, water well to settle the soil around the bulbs. Roots and sprints will form in a few weeks depending on soil and air temperatures. When in bloom, feel free to cut freesia flowers for striking bouquets and sweet fragrance. This is the main reason many people choose to grow freesia plants. Later in the summer the leaves will yellow and die back as the plant slips into dormancy. Foliage many be removed at this point. Your freesia will rest for a few months before beginning the next growing cycle. Fill your containers with good quality, well-drained soil. Almost any commercially available potting medium will work fine. Make sure there are adequate drainage holes; freesia bulbs must never sit in waterlogged soil or they will rot. Site your containers in full sun. Plant your freesia 2" deep and 2" apart for the most brilliant display. Position bulbs with the pointy ends up. After planting, water your containers well to settle the soil around the bulbs. Roots will form in the fall. Winter will bring taller growth and flowers will form in the spring. Enjoy your flowering containers, snipping a few flowers if you like. This won't hurt your plants and provides lovey, fragrant flowers for arranging. In early fall the leaves will yellow and die back as the plant slips into dormancy. Foliage many be removed at this point. Your feesia will rest for a few months before beginning the next growing cycle in the spring.